A4 (Mounted) 7.3 x 9.3 in. (186 x 237 mm) 11 x 14 in. Tripura Sundari, the "Beautiful Lady (Skt. sundari) of the Three Cities (Skt. tripura)", appears as the third of the ten Mahavidya or ‘Great Knowledge’ goddesses. Among her thousand epithets she is also known by the names of: Sodashi (sixteen year-old), Lalita (playful), and Kameshvari (goddess of desire). She is also identified as Shri Vidya (glorious knowledge), who is worshipped by her well-known Shri Yantra or Shri Chakra, with its complex geometric structure of nine intersecting triangles that create a configuration of forty-three smaller triangles. The term Tripura relates to a Puranic legend where the great gods or devas, led by Shiva, ultimately destroy the three fortress cities of the demons or asuras. Built respectively from gold, silver and iron, these cities symbolically relate to the three gunas or ‘qualities of nature’: sattva or purity (gold), rajas or activity (silver), and tamas or inertia (iron). Tripura Sundari is extremely beautiful, alluring and youthful like a sixteen-year-old (Skt. sodashi), with full breasts, a narrow waist, three bewitching eyes, and either four or six arms. She shines like the radiant light of the rising sun, with a complexion like cinnabar or a red hibiscus flower, and is clothed in garments of embroidered red, blue and green silk. She is adorned with a garland of severed heads and all manner of jeweled ornaments, including the Newar neck ornaments of a golden choker, lozenge-like tayo, necklace of coins, and a square medallion on a long chain. With her first two right and left hands she holds five arrows and a bow, with her second pair she holds a hook and a rope noose, and with her third pair a fire-licked sword and a shield. Her four attributes of five arrows, a bow, a hook and a noose all symbolize her powerful abilities to subjugate, magnetize and enchant all beings. She sits in vajra-posture upon the recumbent body of white Shiva, who lies across the golden sun disc of her pink lotus throne. Shiva’s five heads are coloured white (centre), red (right), green (rear), blue (left), and yellow (above): each of these three-eyed faces are peaceful and adorned with five-jewel crowns. Shiva wears gold and serpent ornaments, a tiger-skin loincloth, and makes the abhaya-mudra of dispelling fear and the boon-granting varada-mudra with his first two hands, and holds his twin attributes of a damaru and trident with his second pair. Three of the four great Vedic gods of Tripura’s ‘corpse throne’ are shown attempting to lift her pink lotus seat from the base of her ornate golden throne; with four-face yellow Brahma (left), green Vishnu (centre), and orange Indra (right) with his horizontal third-eye. The fourth of these gods, blue Rudra, would appear behind her lotus seat. Tripura Sundari’s fiery golden halo and the yellow, orange, light and dark red layered flames of her aura are contained within the arch or torana of her throne's elaborate backrest. And behind her five-jewelled crown or tiara appears her iconic Shri Yantra, with its interlocking configuration of forty-two red and white triangles, which are created from five downward-pointing female triangles (Shakti), and four upward-pointing male triangles (Shiva). Outside of this 'sacred device' are white and red lotus circles of eight and sixteen petals, and the squared four directional gateways of her yantra’s bhupura or ‘earth-city’: white (east), yellow (south), red (west), and blue (north). Her ornate golden throne and its backrest are decorated in the traditional Newar style, with the upper arch or torana supporting the mythical paired makaras or ‘water-monsters’, paired dragons, and the serpent-devouring head of Cheppu or Kirtimukha (the 'face of glory') at the top. The two narrow inner pillars that support this torana contain images of the ‘Eight Mother Goddesses' (Skt. Astamatrika), who are the shaktis or female counterparts of the wrathful 'Eight Bhairavas' (Skt. Astabhairava) that protect the eight directional quarters of the Kathmandu Valley. Each of these matrikas or ‘mothers’ has eight attribute-bearing arms and a specific vahana or 'vehicle'. On the left pillar are: Vaishnavi on garuda (bottom); Kaumari on her peacock; Maheshvari on her bull, and Brahmani on her goose (top). And on the right pillar are: Mahalakshmi on her lion (bottom); Chamunda on her human corpse; Indrani on her elephant; and Varahi on her buffalo. Along with these eight mother goddesses the golden images of the ten great Mahavidya goddesses are depicted upon Tripura’s throne and backrest, with three appearing on her throne's upper torana, four on the outer pillars, and three on the panels of her throne base. As the principle goddess Tripura Sundari – listed as the third Mahavidya – crowns this composition; while four-armed Kali – listed as the first of the ten Mahavidyas appears to her right, with the remaining Mahavidyas circling in a clockwise sequence. Kali squats naked upon the ‘corpse’ of Shiva, wearing corpse earrings and a girdle of severed arms. With her two right hands she makes the varada-mudra and abhaya-mudra, and with her two left hands holds a severed-head and a sword or cleaver. Tara, the second of the Mahavidyas, appears on the upper right outer pillar, and stands in pratyalidha posture with her right foot pressing upon a naked enemy-demon. She wears silk garments, jewel ornaments, and stretches a freshly-flayed elephant-skin across her back. With her first two hands she holds a curved-knife and a skull-cup, and with her upper two hands a sword and a lotus. Bhuvaneshvari, the fourth Mahavidya, appears on the lower right outer pillar. She likewise stands in pratyalidha posture upon her lotus throne, wearing silk garments and jewel ornaments. With her lower left and right hands she makes the varada-mudra and abhaya-mudra, and with her two upper hands holds an iron hook and a rope-noose. Bhairavi, the fifth Mahavidya, appears on the lower right panel of Tripura’s throne base. She likewise stands in pratyalidha posture on her lotus throne, wearing silk garments and jewel ornaments. With her lower left and right hands she also makes the varada-mudra and abhaya-mudra, and with her two upper hands holds a rosary and a sacred text. 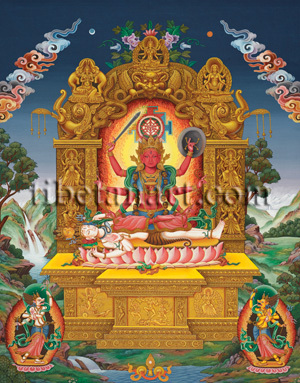 Chinnamasta, the red ‘severed-head’ goddess and sixth Mahavidya, appears on the wide central panel of the throne base. She dances upon the copulating forms of Kama - the god of love, and his consort Rati (or Shiva and Parvati) who are amorously engaged in 'reversed' sexual union. Chinnamasta holds her curved knife in her right hand and a skull-cup containing her severed head in her left hand. Her two naked attendants, Varini (left) and Dakini (right), similarly dance holding their knives and skull-cups, while three jets of blood stream out of Chinnamasta’s open neck and cascade into the mouths of all three of these powerful charnel ground goddesses. Dhumavati, the ‘smoke-coloured one’ and seventh Mahavidya, appears on the lower left panel of the throne base. Considered inauspicious she is a goddess of poverty, misery, misfortune and widowhood. She rides in a chariot drawn by a black crow and holds a piece of cloth and an empty winnowing basket in her right and left hands. She is emaciated with sagging breasts, disheveled grey hair, protruding teeth, and trembles continually. Bagala or Bagalamukhi, the ‘crane-headed one' is the eighth Mahavidya and appears on the lower left outer pillar. She is shown in the act of destroying the demon Madan, the ‘seducer’, by seizing his tongue to subjugate his omniscient powers of speech, as she raises her club to destroy him. With her other two left and right hands she wields a vajra and a rope noose. Matangi, the ‘she-elephant’, is the ninth Mahavidya and appears on the upper left outer pillar. She is both a royal and tribal goddess of magical powers, who can defeat demons and re-establish peace, harmony and prosperity. She stands in alidha posture wearing silk garments, and the tayo or ornamental necklace of a Newar kumari or 'virgin goddess'. She holds an elephant hook and rope-noose in her lower right and left hands, and with her two upper hands she holds a sword and shield as she stretches the flayed skin of a human enemy behind her back. Kamala, the ‘lotus-lady’, or Gaja-Lakshmi, meaning ‘Elephant Lakshmi’, is the tenth and last of the Mahavidya goddesses, and appears above the makara on the left of the throne's upper torana. She sits peacefully in a posture of royal-ease upon her lotus seat, and with her two hands in front of her heart holds the stems of two red lotus flowers. On either side of her stand two elephants, who bathe her with auspicious water from their trunks. In the lower left and right corners are the white lion-headed guardian goddess Simhini (left), and the yellow tiger-headed Vyaghrini (right), who are similar in their mirror-image appearances. They are both fierce with two-eyes, wear divine silk garments and jewel ornaments, and stand upon sun-discs and lotuses within fiery auras. With their first two hands they hold skull-cups and make the bindu-kapala-mudra, and with their second pair of hands hold a damaru and trident.